A single entry blog about a five day trip to the Lone Star State. Winter golf trips are great. They help you forget all about the cold, nasty weather back home and you have a chance to enjoy tempertures in the 70s and swing the sticks again. With a full season of playing city league basketball and running a youth basketball league ahead this winter, it was time to get away for the last golf trip of 2007. With warm tempertures and great food on our mind it was a no-brainer to head down south to the Lone Star State. Flights out of Salt Lake were cheaper into Dallas than Houston so we flew into Dallas/Fort Worth and started the trip off at Vaquero Golf Club in Westlake. 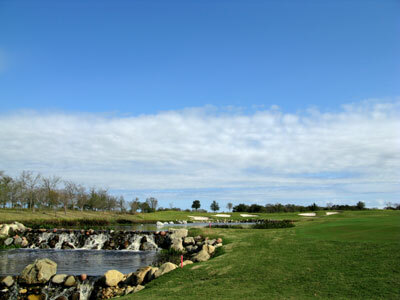 Vaquero is a Tom Fazio design that currently ranks 18th on Golf Digest's Best in State list for Texas. The course was great, as usual for a Fazio course, with creative bunkering and challenging greens, but the two things I'll remember most from our round there are: 1. We saw Hank Haney (Tiger Woods' swing coach) giving a playing lesson two holes behind us. 2. Vaquero has the BEST hot dogs ever consumed on a golf trip. Vaquero actually makes their own hot dogs on site by blending the meat and spices into a sausage that is to die for. We went with the jalapeno flavored sausage loaded with fresh toppings and could hardly concentrate for the next few holes; great stuff! Following our round at Vaquero we wanted some authentic southern BBQ. With both of us being unfamiliar with the Dallas area we weren't sure where to stop. So we asked Nikki (our Garmin Nuvi 350 GPS unit) where the closest BBQ place to eat was. As always, she came through with a place to eat and perfect directions to get there. The only problem in the end was that the BBQ wasn't really up to hype we were expecting. The hot rolls they brought out were great, but better BBQ would surely be in our future while on this trip. From there it was on the road to Houston where 36 holes awaited us the next day. Day 2 was supposed to be a trip to Whispering Pines and Miramont, however I somehow got the schedule screwed up in my head and we showed up at Carlton Woods wondering why in the world they didn't have us down on their tee sheet. Fortunately, the staff at Carlton Woods was more than accomodating and had us out on the courses before we knew it. We golfed with Mir Wais, 1st assistant professional, who was out for his first round of golf since suffering a stroke earlier in the year while playing at the World Series of Poker in Las Vegas. Mir was a fantastic host and offered plenty of local knowledge and stories about the Nicklaus course that opened in 2001. Top notch conditioning is obviously a major emphasis at Carlton Woods with the fairways playing beautifully and the green rolling near 13 on the stimpmeter. The signature hole at the Nicklaus course is the par four 15th with water coming into play from every direction and finishing at a pond fronted green with a waterfall. The afternoon offered up the Fazio course at Carlton Woods that opened in 2005. It is classic Fazio work with impressive bunkering and contoured greens. An excellent aspect of the Fazio course that very few courses in Houston offers are elevation changes throughout the routing. It is debateable whether the heavily bunkered par three 16th or the quality finishing hole would be considered the signature, but either way you are in for a treat if you get the opportunity to visit the posh Carlton Woods courses. Following our visit to Carlton Woods we cleaned up in preparation of heading to the Houston Rockets vs Phoenix Suns game where my cousin, Bret Bearup, hooked us up with tickets. Bret is a former basketball player for the University of Kentucky Wildcats where he played with the likes of Sam Bowie and Kenny "Sky" Walker. When his playing hoops days were over Bret earned his law degree and eventually went on to operate a successful financial firm representing athletes and their money. Today Bret is an advisor for the Denver Nuggets and has hooked me up countless times with tickets to sporting events and concerts. Simply put, Bret is the man! Prior to attending the game though it was time to enjoy the world's finest steak fajitas at Billy's favorite Tex-Mex restaurant in Houston; Pappasitos! Oh, just typing the name Pappasitos makes me hungry. I'm sure Pappasitos has great food other than their fajitas, but I can't ever talk myself into ordering anything else. There are a couple of key elements that make Pappasitos fajitas flat out phenomonal. First, the meat is marinated in a combination of soy sauce, pineapple juice, and water that produces a very soft steak with extraordinary taste. The second major key is the fresh tortillas. Pappasitos has a machine that sits out in the restaurant and features a circular conveyor where fresh dough is placed on the belt, is smashed into shape by a stamp, and then continues to cook as it travels down the conveyor until it falls out at the bottom and into a basket where the fresh tortillas are served. YUM! So after screwing up the previous day's schedule it was time to get things back on track by visiting Miramont and Whispering Pines. 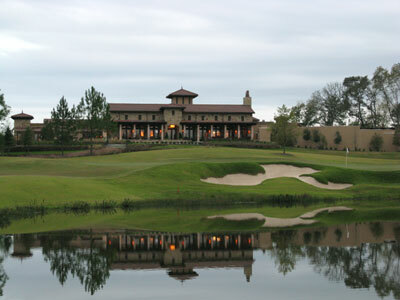 Miramont Country Club is a private upscale Robert Trent Jones Jr. design located in Bryan a couple of miles from the Texas A&M campus. Water comes into play on the majority of holes on the back nine as well as on the par three 2nd hole. The signature hole is the par four 13th that features a lake with a series of waterfalls down the entire left side of the hole. Robert Trent Jones Jr. always seems to do a solid job with attractive bunkers, nice water features, and an overall nice routing and Miramont was no exception. The feature that may stand out the most is the incredibly impressive brick clubhouse that boasts 93,000 square feet and includes 15 guest suites and stylish locker rooms with all the latest features. After a late start at Miramont due to the previous night's rain, we dashed off to the remote location of Texas' finest golf course; Whispering Pines. 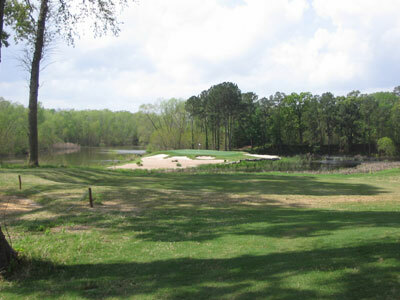 Located on 400 acres in the piney trees 90 miles north of Houston near the town of Trinity, Whispering Pines is a spectacular course designed by Chet Williams (Nicklaus Designs) with the input of owner Corby Robertson Jr. who originally purchased the ground to operate a summer camp on. The course is a journey through the woods with natural water hazards and masterfully crafted bunkers throughout the course. There isn't a "dog" hole on the course, but the final five holes that play along Caney Creek and Lake Livingston are as good as Texas golf gets. 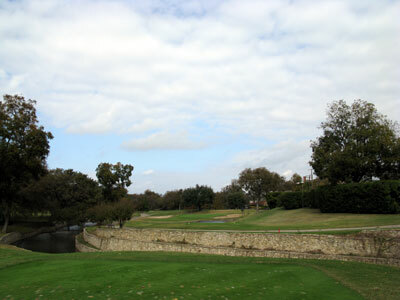 In fact, all five of the finishing holes made the Dallas Morning News' list of the best 18 holes in Texas; Dallas National was the only other course that featured multiple holes on the list by posting three. The seasonal club is only open in the spring and fall and offers four cottages for members and their guests to stay in while visiting the club. Coupled with the caddy service provided at the club, it offers the perfect opportunity to put together a buddies weekend of golf at one of America's finest courses and locations. I could go on and on about how awesome of a course and facility Whispering Pines is, but why don't you go ahead and just check out my full Whispering Pines review here. We struck out on BBQ in Texas for the second time on the trip by stopping at some dive in Hunstville. We each ordered a combination plate that consisted of ribs, sausage, brisket, and pulled pork. The brisket needed a chainsaw to cut, the ribs had sat under a heating lamp too long, the sausage was edible, and the pulled pork was drier than the Sahara Desert. Couple the lousy food with terrible service and we didn't feel an ounce of guilt for not leaving a tip. Having lived in Houston before I know there is plenty of great BBQ to be had, but we were north of the area I was familiar with and were making stabs in the dark. Where is a Pappa's BBQ when you need it? With bad BBQ not settling right in the ol' digestive system there was only one thing any self respecting Texan would do; stop at Wal-Mart and load up on Blue Bell Ice Cream. Oh, just the name of Blue Bell gets my taste buds all revved up in anticipation of earth's greatest ice cream. Yes, that's right, Blue Bell is better than Ben & Jerry's, Hagan Das, or even your Grandmother's homemade ice cream. The company slogan is, "We eat all we can and sell the rest." It may sound a little ridiculous, but I think it is flat out true. Blue Bell was appropriately the staple item to eat each night on the trip and was the perfect compliment to relaxing in the condo's hot tub to cap off the night. The next day was spent at Walden on Lake Conroe which vaulted to 3rd on Golf Digest's Best in State list for Texas in 2007-08 after not appearing on the 2005-06 list. 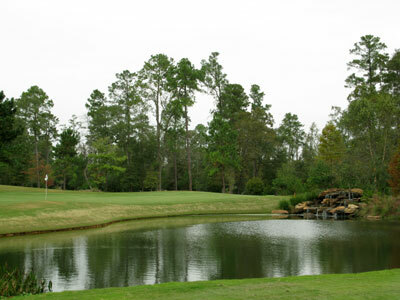 Walden's course is highlighted by the notorius 11th - 13th stretch of holes known as Walden's version of the Bermuda Triangle where the beauty and number of lost balls is unsurpassed in Houston. 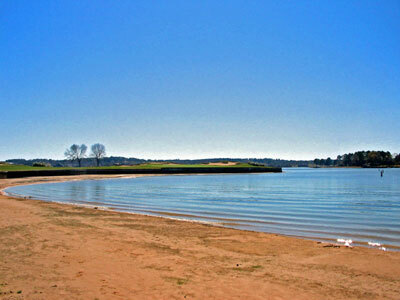 The 11th is a fantastic double dogleg hole that finishes on a peninsula green peering out into Lake Conroe. This hole was voted by Golf Magazine as one of the top 500 holes in the world. The triangle wraps up with a par three along the coast for the 12th hole and then an uphill par four with a forced carry over the lake for the 13th hole. Walden is a much improved course from the previous years and a joy to play. Is this blog getting long? Well, let's wrap things up. Monday evening was spent watching the Denver Broncos and Tennessee Titans battle it out on Monday Night Football at my favorite seafood restaurant in Houston; Pappadeauxs. We started things off the way every trip to Pappadeauxs should be started and that was with a mega bowl of their crawfish bisque. Writting this blog is killing me. Pappasitos fajitas, Blue Bell ice cream, and now Pappadeauxs crawfish bisque; I need to clean up the drool off my laptop. Eating the mega bowl of crawfish bisque and a caesar salad each was more than enough to satisfy, but on golf trips we don't eat to satisfy, we eat until we are ready to explode. So with that it was time to order a meal and the Pappadeaux Seafood Platter was just the ticket. The massive platter came out with a variety of fried foods including shrimp, crawfish, oysters, catfish, and stuffed shrimp. We took one look at that food laid out over a bed of french fries and wondered to ourselves how in the world we were going to eat that much food. Then another platter came out. We informed the waitress we only wanted one order and her reply was simply, "This is just one order." The exact same platter came out except instead of stuffed shrimp there was stuffed crab. It was easily the best fried food I'd ever had in my life and by the time we left I could have been added to the menu as Stuffed Guru. The next morning we woke up at 3:45 AM and ate the remaining Blue Bell ice cream for breakfast before heading on the nearly four hour journey north back to Fort Worth where the final round of the trip would be spent at historic Colonial Country Club. The Crowne Plaza Invitational at Colonial is the longest running event still on the PGA Tour. 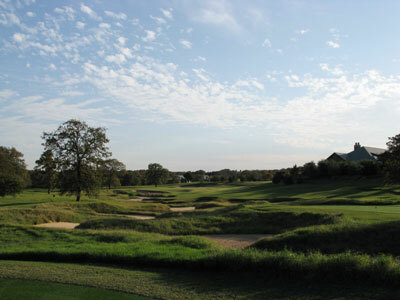 The course runs through pecan trees and is highlighted by Hogan's Alley, the difficult stretch consisting of the 3rd - 5th holes. In fact, Ben Hogan holds the record for most career victories at Colonial with five. Colonial is a classic routing featuring many doglegs and requiring solid shotmaking to neogiate the bunkers and gets on the correct portion of the greens. Keith Foster has been contracted by the club to work on restoring and renovating the course and the project with hit full steam with the majority of renovations being started two weeks after this year's Crowne Plaza Invitational. Like every golf trip, it eventually has to come to an end. It is a sad moment leaving the wonderful food and warm weather of Texas but what must be must be. It is another successful guys only golf trip where the main topic of conversation on the way home is where the next great golf trip will take us.